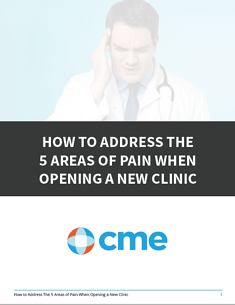 At CME, we realize that opening a new clinic is not without its problems. Toils, frustrations and, yes, even pain sometimes occur. To check this out and confirm our suspicions, we recently polled some newer customers and asked them to describe some of the areas of pain they experienced when trying to open a new clinic. We only asked customers that opened larger clinics, those with over 20 exam rooms. After compiling the list, the many pains seemed to land in 5 distinct areas. To Download this FREE eBook, please fill out the form.